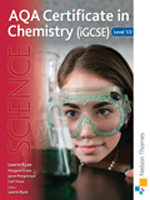 This student book has been designed to provide the skills, knowledge and understanding your students require to meet the AQA Chemistry Level 1/2 specification, as well as giving excellent preparation for A Level Science studies. Specifically written for the AQA Certificate in Chemistry Level 1/2 it provides a perfect match to the new specification. Covers new features of the specification such as the Paper 2 exam, with specific questions aimed at developing experimental and investigative skills. Maths Skills sections support the mathematical element of the specification, with short visual explanations. Each topic has challenging summary questions, with the last question requiring a more extended answer.